Andy Bechtolsheim, one of the co-founders of Sun Microsystems and a Stanford Engineering Hero gave a talk today at Stanford on The Process of Innovation. It was streamed online. This time around, while listening to the lecture and watching the slides that were webcast, I tried something new. I started to create a mind map of his talk as it was going on and below is what I ended up with. I will go into some of the key points that were brought up as I feel they are pretty important. First, a little bit on why I created this mind map. We have all taken notes from time immemorial, in schools and colleges, in meetings. When you are all done, they end up looking like a long document, which doesn’t really inspire you to go back to reading, well, unless you are in school or college and its the last night before the exam, and at that moment it does not matter that you actually did not take those notes! A mind map is a well known technique. It is essentially a diagram of words, ideas, linked to each other and arranged in some fashion, all around a central theme. It creates a visual that is relatively easier to follow and synthesize, if done correctly. 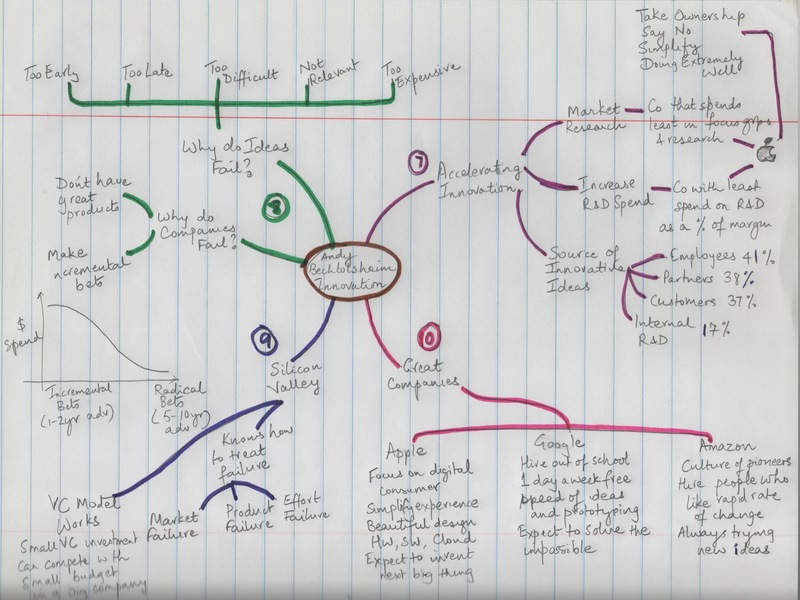 So here’s my mind map of Bechtolsheim’s talk on innovation (click to enlarge). Since this was my first time doing this, I know I have missed out on capturing some points. As you can see, Bechtolsheim covered a variety of topics in his talk. It was a great talk. 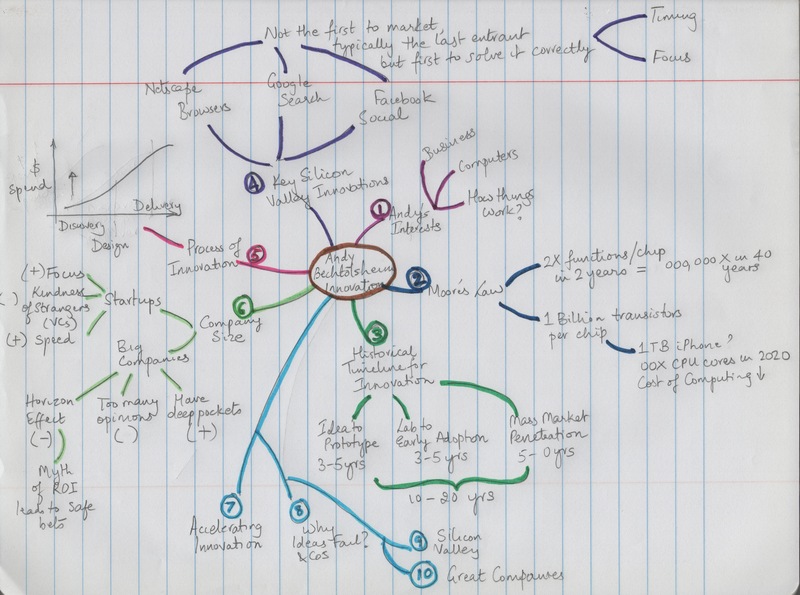 The mind map actually allows me to revisit his talk and review the salient points made. It is much better than scribbled notes. Now let’s turn to the topic of innovation itself. I am going to highlight 5 key points that Bechtolsheim made. When Netscape came into the market, there was a plethora of browsers that existed before. But Netscape, though late to the market, was the one to get mainstream adoption. A few things conspired to make this happen. At the time of Netscape, the HTML specification was undergoing revisions that allowed web designers more creativity and control. The new HTML tags could only be read by Netscape. This helped to make Netscape ubiquitous. So it was a perfect storm of the evolution of HTML, the graphical web, an eager user population, and a focused team at Netscape driving the Internet forward. Bechtolsheim’s point was that Netscape with browsers, Google with search and Facebook with social networking, were all late to the market, and in fact the last entrants. Yet, they were the one to penetrate the mass market and lead their categories because they solved it correctly and executed with focus. These are the three steps in the innovation process. However, Bechtolsheim argued that companies spend the most amount of money in the delivery phase where they are trying to deliver the innovation to the market. Not enough investment is made in the discovery phase. In comparing the propensity of startups vs large companies to innovate, Bechtolsheim said that large companies typically tend to make safe bets. They suffer from the Horizon Effect, which indicates that majority of people and companies only pursue goals which are on the horizon. We solve the stuff we can see instead of stuff we cannot see. In large companies, investment cases are put together and projects do not move forward if they don’t clear the internal rate of return bar. As a result, large companies tend to make incremental bets, which give a 1-2 year advantage in the market. Startups tend to make radical bets which tend to give a 5-10 year advantage. Bechtolsheim suggests that companies try to strike a balance between how they invest in making incremental bets and radical bets. He also suggests that the Silicon Valley model of VC backed startups works very well because small VC investments can effectively compete with small budgets of large companies. Most large companies run the risk of actually not having great products, the implications of which pale in comparison to not making radical bets that are perceived risky. This is good to understand. Bechtolsheim listed five reasons why ideas fail. Too early – The Apple Newton was clearly too early to the market. The product has its share of challenges being pricey and clunky, but as a concept it was far too ahead of its time. Too late – Are the new crop of social networking companies too late to the market? Has Facebook become too big? It remains to be seen. But how about the Microsoft music player, Zune? It was a “me too” product and could never really dent the iPod’s dominant position in the market. Too difficult – The Segway comes to mind. I haven’t had a chance to ride one, but one gets the sense that it would not be very easy to use for most people. There have been videos posted online about Segway accidents and one remembers President Bush falling from one. Not relevant – In 2007, Palm introduced the Palm Foleo, a kind-of notebook companion to the Treo phones. It discontinued the product just three months later. Among the many problems the product had, it required to be synchronized with the phone to be able to send email instead of sending email over WiFi. This product was widely criticized for not being full function and as a result became irrelevant. Too expensive – Products tend to be expensive for a couple of reasons, one being they are ahead of their time and hence either the manufacturing is expensive or the cost of technology components is high or both. The Newton certainly was expensive with a $1,000 price tag. Bechtolsheim cites Apple, Google and Amazon as three companies who have fostered a culture of innovation. Apple expects to invent the next big thing. Google expects to solve impossible problems, like the self-driving car for instance. Amazon is always trying new ideas without fear of failure. Each of these companies have defined their focus, hire people that fit with their culture, and have executed successfully beyond their initial forays – Apple from Macs into mobile devices, Google from search into many services and a mobile operating system, Amazon from retailing books online to the biggest provider of cloud compute services. It was an insightful lecture. Thanks for the writeup Rahul. Nicely summarized. The horizon effect is a real challenge for most companies. Thanks for your comment, Vinay! Enjoyed reading the article, Rahul. Excellent summary. Thanks.